Torque wrenches with adjustable scale. 1/2" Square. Torque range of 50-350Nm, with a 2.5 Nm Scale graduation. Torque wrenches with adjustable scale. 1/2" Square. Torque range of 40-200Nm, with a 1.0 Nm Scale graduation. 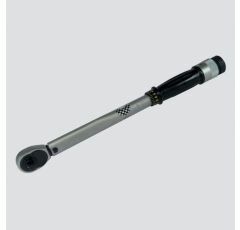 Torque wrenches with adjustable scale. 3/8" Square. Torque range of 20-100Nm, with a 0.5 Nm Scale graduation. Torque wrenches with adjustable scale. 3/8" Square. Torque range of 10-50Nm, with a 0.5 Nm Scale graduation. Torque wrenches with adjustable scale. 1/4" Square. Torque range of 4-20Nm, with a 0.1 Nm Scale graduation.